There are no ACCS Schools near me, what are my options? Check ACCS Find a School for both local, and Online schools. Online has its limitations, but can be an excellent alternative for some families. Consider posting on our School Startup Groups to find others interested in starting a school in your area. If these steps don’t help, many families choose to move to an area with a classical Christian school. Another option is to homeschool classically. The ACCS does not directly provide resources in this area, but there are many who do. We do recommend you choose a Christian option, particularly when choosing a classical school. If a school claims it is “classical Christian,” how can I tell if it really is? It can be difficult to tell. Ask why they are not members of the ACCS. There are many good classical Christian schools that are not ACCS members, but their “why” may provide some insight. Sometimes, schools do not meet our membership requirements. 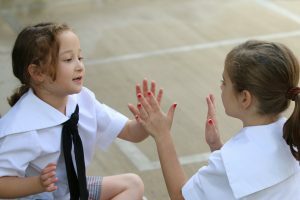 What are the advantages of my child attending an ACCS school? 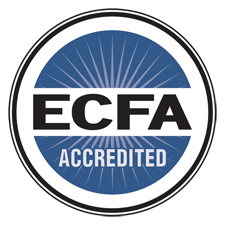 The ACCS is widely recognized as the voice of classical Christian education. Many colleges actively seek out ACCS graduates. We have a comprehensive system to help ensure that schools conform to the model. The advantages of a classical Christian education are worth considering. What issues may my student encounter because they attend an ACCS school with ACCS Accreditation? Rarely do our students encounter any issues with our accreditation. In fact, ACCS graduates are most often sought after by colleges. In some states, students may have challenges when transferring into a traditional high school after the freshman year at an ACCS high school. Sports programs may be limited at some ACCS schools. And, the diploma earned at an ACCS Accredited school may not be recognized as a “state-authorized diploma.” These points aside, the data indicate that our students are accepted to top colleges in higher proportions than from other types of schools. I’m moving. How can I transfer my students to another ACCS school? Our member schools are typically thrilled to have students transfer from another ACCS school. Check our school finder and click “More Info” for details about a particular school. Member schools vary in their classical approach more than our Accredited schools do, so we encourage you to check into your options before you move. I have concerns with the ACCS school my child attends. What should I do? Each of our schools is independent. The ACCS does not arbitrate on behalf of its members. Please take matters directly to the school’s administration. If your concerns are with an ACCS Accredited school, we will accept a 1-page, typed letter mailed to our office describing the concern. We WILL make this letter available to the school in question, including the identity of its author. Matters described within the letter and the response from the school will be considered during the next accreditation round. How can I become a certified ACCS teacher? You must work at an Accredited ACCS member school. The process varies from school to school. Certifications are registered with our central office. How can I find an ACCS school and apply for work? Check our job postings to see if you qualify for any current positions. We strongly advise that you enter your CV and answer our questionnaire online. Some schools do not post positions, but they are sent our CV list periodically. These ads are distributed to all of our members and cataloged for use for up to 6 months. How can I prepare myself to work at an ACCS school? 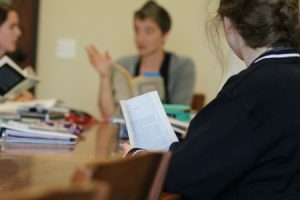 ACCS member schools look for teachers with a classical education background (though typically not a public school teaching certificate), a love of books and learning, and a widely varied set of skills. A number of colleges specialize in training classical Christian thinkers and educators. Teachers who can teach Latin, Greek, math, rhetoric, logic, or science are often in demand. I’m not employed by an ACCS member school. Can I access ACCS resources? We have individual affiliation, which provides access to our conference, Classis, and mailing list. However, you must be employed by a member school to access the MRC, the key ACCS tool for classical educators. We find schools sometimes misunderstand our standards. Please visit our member qualifications to see if your school qualifies. Our membership has a fixed fee annually plus a fee for each full-time k-12 student. The current fees are here. For new schools with larger student bodies, we are willing to work with the school to moderate the fees for the first year to help with budget transitions. Can you help with a school that is transitioning to a classical model? Yes! We have a new form of membership called a “Transitional Member.” These members do not need to meet our educational requirements for 5 years from the date of membership. These schools can then access our Member Resource Center, conferences, webinars, and other tools that will help with the transition. All schools must agree to our Statement of Faith. See Transition a School for more information. Do you offer help to charter or non-christian classical schools? There are several different types of classical education. Because our model of classical education is based in medieval Christian education, we are not able to help charter or non-christian classical schools formally. We do welcome them to our Repairing the Ruins conference and other publicly available resources. What do you offer homeschoolers? Encouragement! God called parents (not the government) to educate children. One way to do that is through an organized Christian day school, or other types of schools. But homeschool is an excellent option– if you have the time and talent to do it well. There are limitations, of course, as there are with any type of school. Homeschools can develop highly independent children, but this can be a blessing and a curse. Homeschoolers are welcome to join as Individual affiliates and attend Repairing the Ruins. What resources are there to help my congregation understand and appreciate CCE? 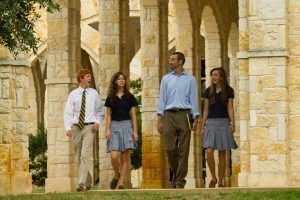 Our informational site provides a straight forward introduction to classical Christian education. Pastors around the country are often amazed at the spiritual nature of our Repairing the Ruins conference. Far from a Christian conference on education, it is a conference about worship– by cultivating the hearts and minds of students. Pastors are increasingly enthusiastic as they see the deep theological knowledge and work ethic of children in their churches who attend classical Christian schools. Who can answer media questions about CCE? Please visit our media center for information. I’m interested in CCE generally. How can I learn more? Our Public Resources are a good place to start. And, once again, The Classical Difference site is helpful, as is our site About Classical Education.